April’s chapter in my Artist’s Way group is Recovering a Sense of Integrity. These chapters are meant to be gone through in a week, but in our group we are taking a month to focus on them and complete their exercises. I must say that I am loving the heck out of this! Each time that I completed the Artist’s Way course, I did it in 12 weeks as it is designed, but feel like I needed to keep going back because it is hard for me to really make a life change in such a short amount of time. I have been super enthusiastic about each chapter until I realized the implications of April’s. One of the exercises that she has you do for the chapter is called “reading deprivation.” This means that you are not to read AT ALL for the entire week. I can’t even begin to tell you the resistance that I experienced while even contemplating what this kind of a commitment could mean for an entire month! That is when I had to get to the spirit of her challenge. She asserts that artists are very often reading addicts. She warns to be careful when depriving oneself of reading not to fill in that time with TV, movies, internet, gossipy conversations, etc. When reading is gone we truly are left with ourself. Our mind. Our boredom. So, for April, i have committed that my reading deprivation will include cutting out the reading that I do for distraction, for learning, and for pleasure. The first week that I did this I felt as though I was coming out of my skin. My dreams were more vivid. My emotions surfaced. I felt uncomfortable. This all turned me to my art. I longed to get busy. That first week I had more fun thinking about what I would create. Reading deprivation, though painful is actually a gift–one that I may use more often. Now that I realize how powerful this tool is, I commit to having integrity in my own dreams to develop my art with the time that I truly have available because this is what I found. I have more time than I previously was aware of. This journaling piece was inspired by, Mt. St. Helens, the mountain in my back yard. She reminds me of the magic of the earth’s secrets. The legends tell us that she has witnessed communities before our own. She is a presence that grounds us and shelters the remaining wild. It is as if she even knows our deepest secrets and longings. Lyrics from Oh Land’s The Wolf & I. 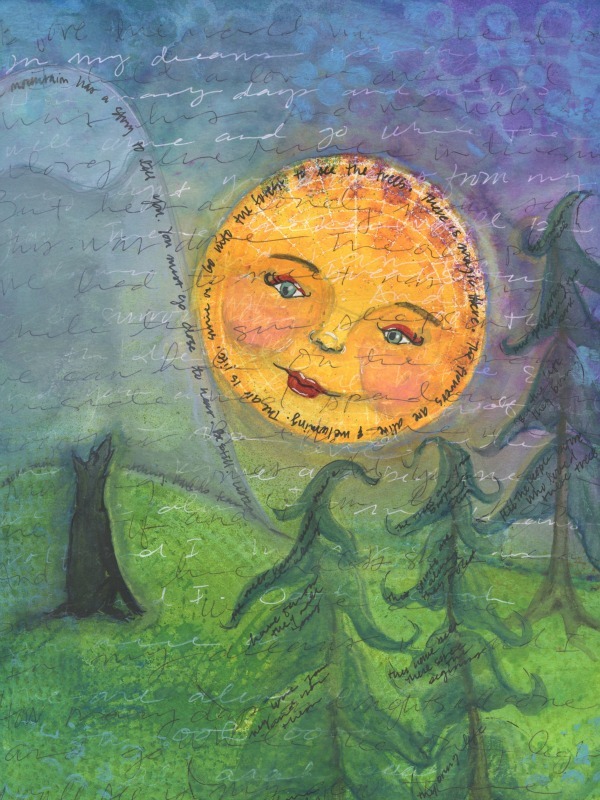 This entry was posted in Uncategorized and tagged art, creativity, journaling, mixed media, moon, The Wolf & I by Oh Land, wolf. Bookmark the permalink. Reading Deprivation wee was the hardest week for me as well, but looking back it was definitely the most rewarding. I spend a lot of time “learning” and not a lot of time doing. I know that I read to distract myself… but I just love to learn. Doing is a lot scarier and a lot less safe. I can’t imagine doing this for an entire month! Maybe it’s something I should consider trying myself though. I’m very inspired by your strength! I am afraid I would come out of my skin and my head would explode. No reading? I love your piece in this one, fabulous. Yes! That is how it feels! Thank you! How did I miss this post? It’s brilliant! I’ve done The Artist’s Way off an on for years, and I love hearing new ways people use it. A month? What genius…taking a full year to integrate The Way is a wonderful idea, although I know I’d struggle with this part!